I have a quick little soup for you today and it’ll take me longer to tell you about it than it will for you to make it. So gather round for a brief chat and then grab your blender and a handful of ingredients and get going. It’s a chilled soup – you might even be tempted to call it a gazpacho, but I’d advise against it because it’s unbelievable creamy. While I haven’t (yet) posted a true tomato and cucumber gazpacho on the site, you might want to check out salmorejo, a Spanish tomato soup I first tried in Seville, or cucumber mint gazpacho adapted from Ten Tables in Provincetown. But back to today’s recipe. I came across it when Rivka mentioned that it was time for one of her oft-repeated cold summer soups. As I’ve been forced to close my window shades from dusk until dawn when I’m not home and crank up the air conditioning while I sleep, it’s a welcome reprieve with a some jalapeño heat – but not enough to get you sweating again – requiring the same amount of effort as cleaning your blender when you’re done. It does greatly benefit from a little bit of crunch to balance out the creaminess, so I toasted up some lavash chips. The lavash itself has a little story, one that left me and my colleagues in a fit of giggles. Friday morning, I was greeted in the restaurant office by the following note perched upon a 4-inch stack of wraps, tortillas, and lavash. A guest last night left this for you: endless possibilities… Some guests palm a hundred for a table. Others shower you in flatbread, I guess. The prior evening, a bakery owner had stopped in for dinner and when we were chatting about his work, he said he’d leave me a few samples from his bakery. I schlepped the bread home, toasted it up with a spray of olive oil and a sprinkle of fleur de sel, and served it next to the soup. Luckily I have enough lavash to for an entire summer’s worth of chilled soup. Adapted from Not Derby Pie’s recipe. This is one of those recipes where you barely chop the ingredients, throw them into a blender, and press a button. One minute later, maybe two, you have soup. 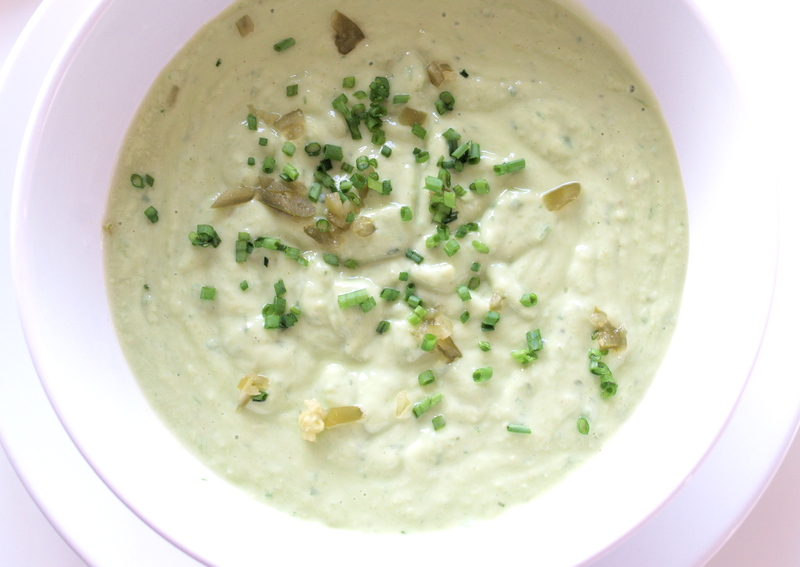 It is quite thick and creamy – if you’d like, add additional cucumbers and extra water to thin it out a bit. Top with something crunchy for a little texture – I used toasted lavash, but pita or tortilla chips would be great too. Update 6/23/14: To thin the soup out a bit, I doubled the cucumbers, and then added a bit extra salt. Excellent! Blend. 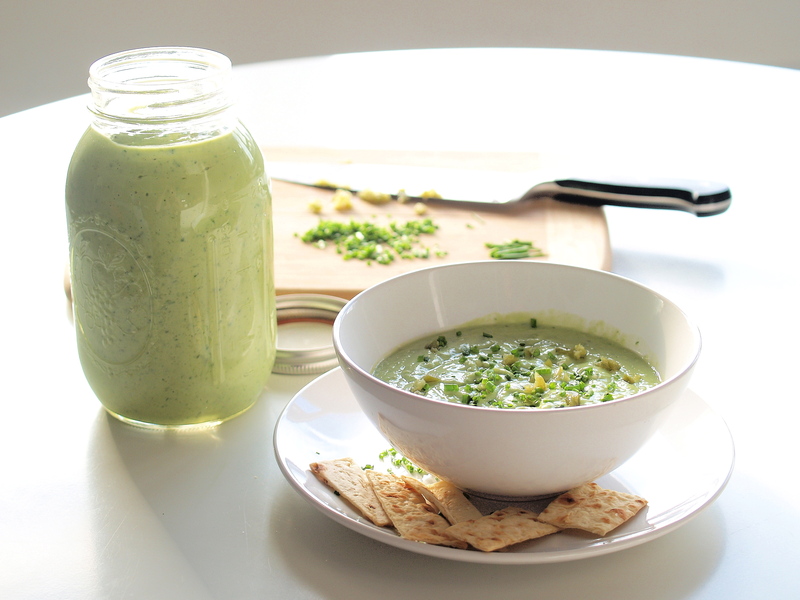 Combine all ingredients in a blender, starting with half of the jalapeño and reserving 4-5 sprigs chives. Add 1/4 cup water to get the blending started, then blend on medium until completely smooth. Taste, and add salt, pepper, and more jalapeno to taste. Thin out with extra water to get the texture that you want. Chill. Refrigerate at least 1 hour. Ladle. Fill bowls and garnish with chives, minced jalapeño, and/or mint. Serve with something crunchy. Once my maitre d’ trail was complete, I found my way back to the kitchen where my refrigerator was overflowing with greenmarket treasures. 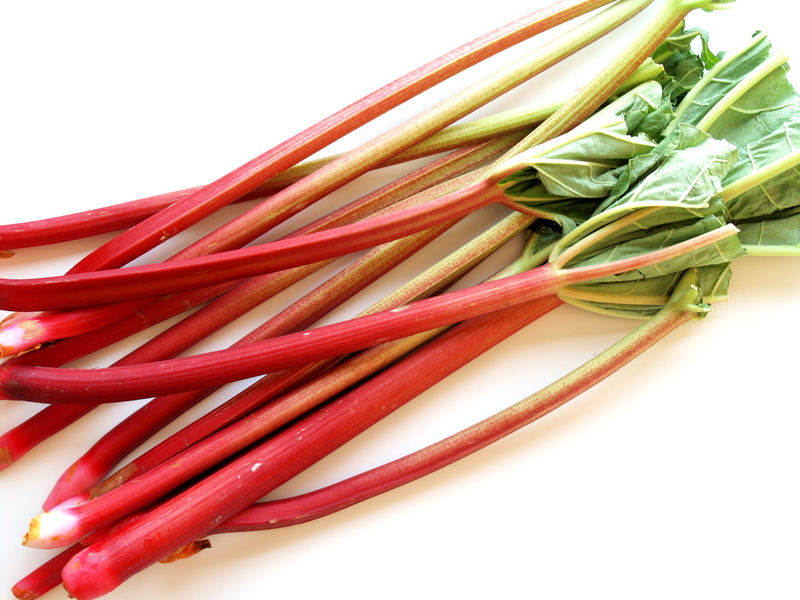 The crimson celery-like stalks of rhubarb beckoned. Now, rhubarb and I don’t have much history. I’m not a fan of cooked berries unless they’re blue or come from a bog, so classic strawberry rhubarb pie, and, by association, rhubarb on its own, and I aren’t the best of friends. We don’t dislike each other; we just don’t run in the same circles. 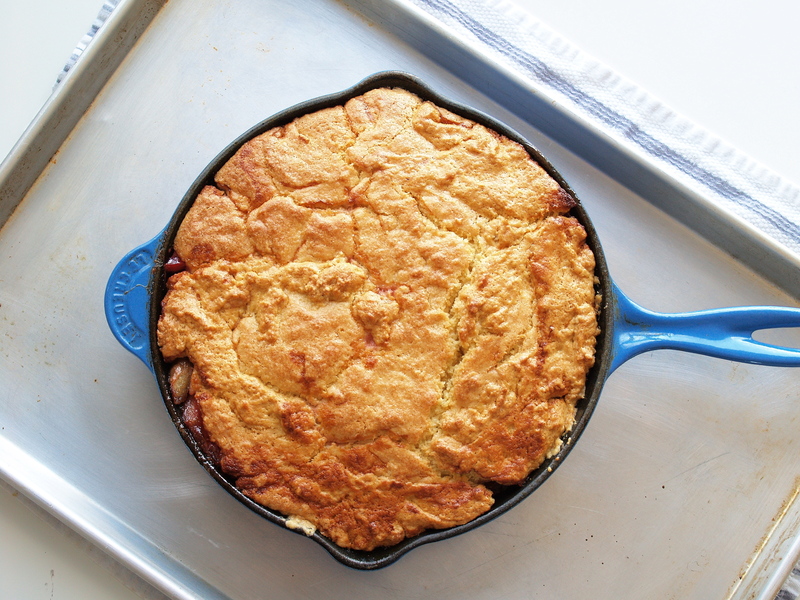 We tried once to hang out – last year when I clipped a Saveur article and drooled over an upside down cake where rhubarb played the starring role. I read the reviews but never made it to the theater of my oven to see diva rhubarb on stage. She waited for me in the cold backstage of my fridge until she went sad and limp. This year, though, I made it my business to rekindle (or is it kindle?) a friendship. So, I got chopping, which I realize is where this little anthropomorphism should probably cease. I cooked down the rhubarb in a few generous pats of butter and a pile of sugar, more mountain than molehill. I looked for caramelization as the recipe suggested, but found only stringy mush in a pool of buttery syrup, more lake than puddle. With a combination of dismay (the rhubarb was, um, interesting looking) and intrigue (but its sweet and tart flavor was swoon-worthy), I persevered. I prepared a cake batter, covered the mess of rhubarb, slid the pan into the oven, and then pulled it out. The flip was a bit less than successful, so there’s no photo of a cake tinged pink. And with rhubarb mush, there was definitely no chance of a lovely cake covered in still discernable rhubarb pieces, flecked with crunchy caramelization. It tasted good enough, but when half of the cake remained after I brought it to family meal at the restaurant, I decided the recipe wasn’t worth a second try. Nonetheless, it left me with a glimmer of hope. The next day, I went back to the market, brought home even more rhubarb, and sweated it out. Literally. It was one of those days when I had to close all of my window shades at high noon to keep the temperature in my apartment manageable even before I fired up the oven. And once the oven began its steady preheating climb, I had to turn on the air conditioning. 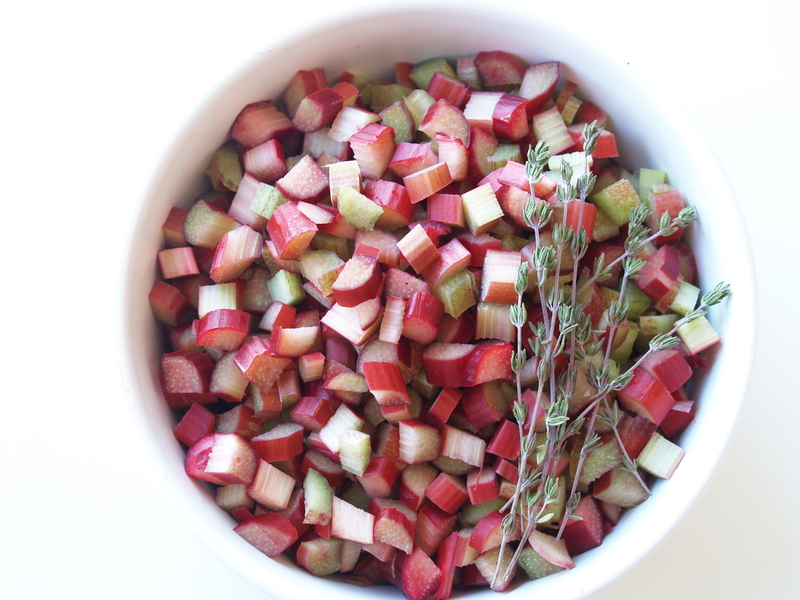 But the rhubarb made me do it, and so do it I did. 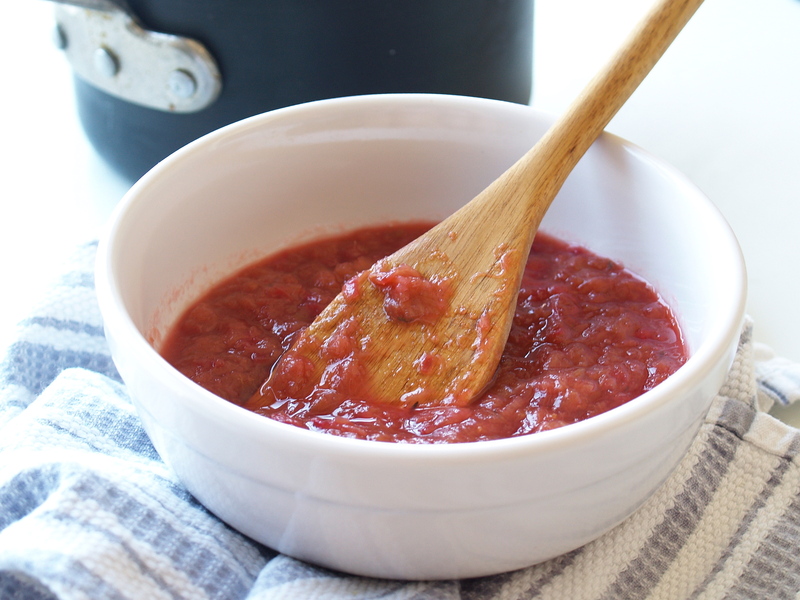 … to a silky compote. Looks a little like cranberry applesauce, no? I threw together the cake batter I had used earlier, reducing the sugar and adding thyme to keep the muffins more breakfast than dessert. 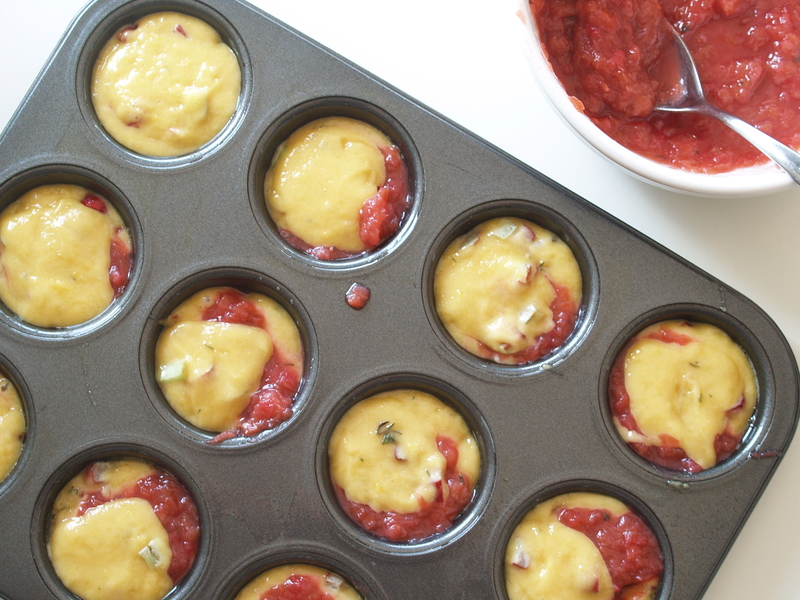 I scooped the batter into muffin tins, dotted with compote, and added another light blanket of batter. Into the oven, and out of that oven, and off went the oven, and on stayed the air conditioning. 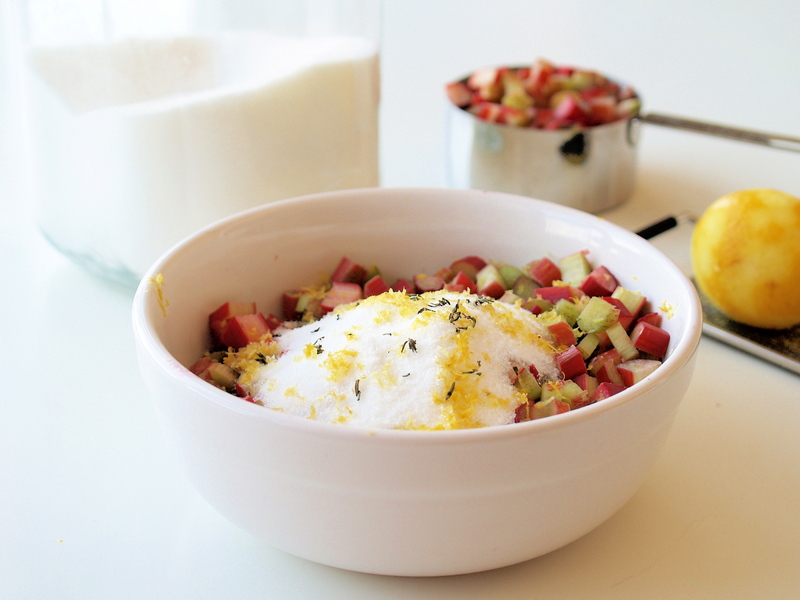 This recipe is inspired by a rhubarb upside-down cake in last year’s Saveur. 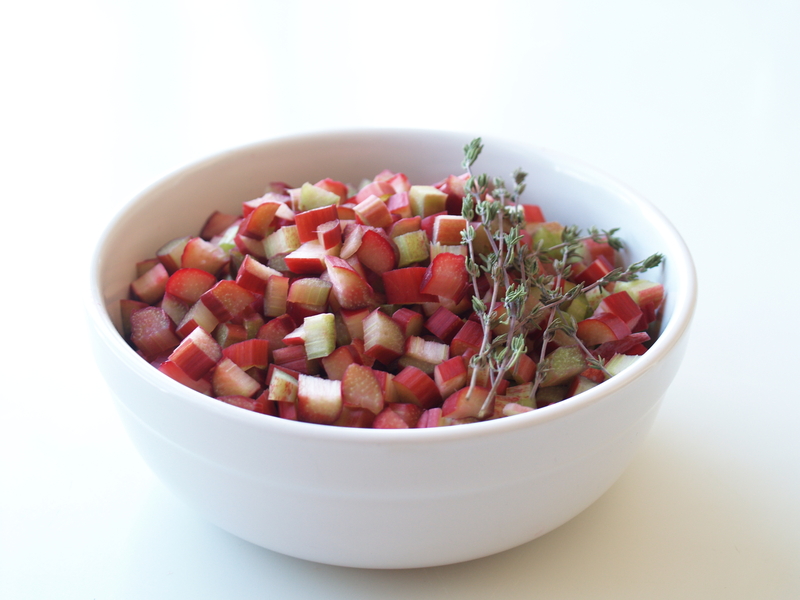 I modified the caramelized rhubarb (which turned into mush, for me at least) into a lush not-too-sweet, still-somewhat-tart compote to which I added thyme based on this recipe. I used thyme because 1) I had it and 2) to keep this muffins out of cupcake territory. You’ll have about 1/2 – 3/4 cup extra compote – it’s fabulous spooned over Greek yogurt with a few clusters of granola. 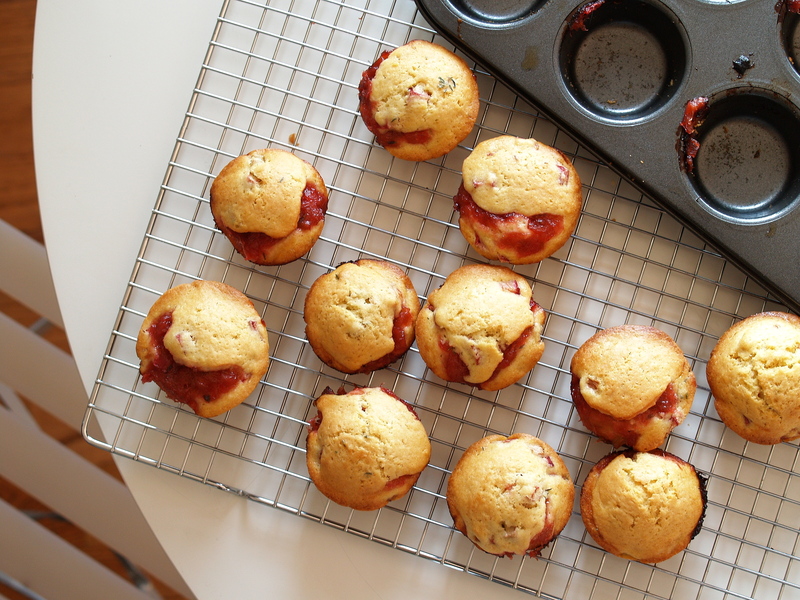 I also added some raw rhubarb to the batter – it cooks up nicely and gives some extra texture and a burst of tartness to the muffins. If I do try to make another rhubarb upside-down cake (and I have another pound-plus of stalks in my fridge), I’m going to go with raw rhubarb on the bottom, à la Melissa Clark’s recipe (read her notes here). 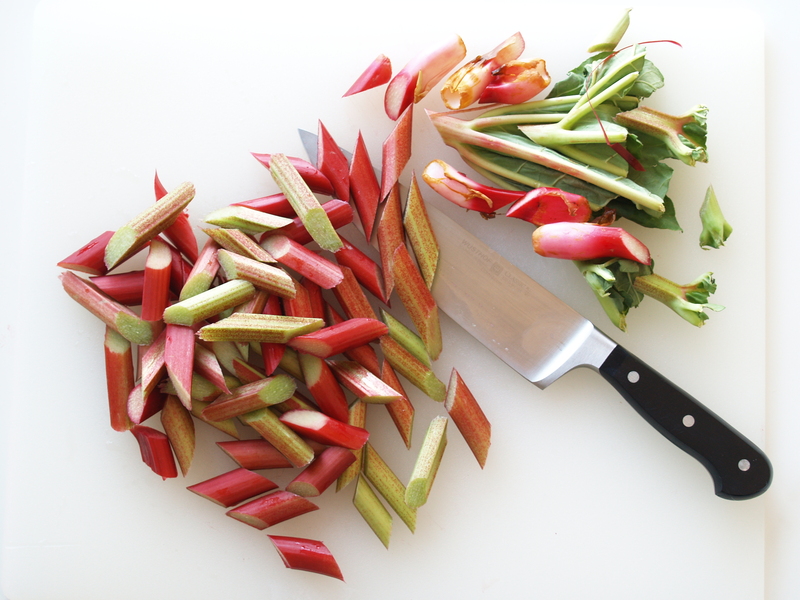 You’ll need a total of 1 1/4 pounds of rhubarb to yield 4 cups chopped. Prep. Preheat oven to 350˚F. Grease a muffin pan. Simmer. Stir together the compote ingredients in a pot and bring to a boil. Lower heat to medium-high and continue to simmer until the rhubarb cooks down to the consistency of applesauce, about 15 minutes. Let cool. Mix. Meanwhile, mix together the batter ingredients. You can mix this all by hand in less time than it takes to drag your stand mixer out of the cabinet. Arrange. Fill each muffin cup with a scant 1/4 cup of batter. 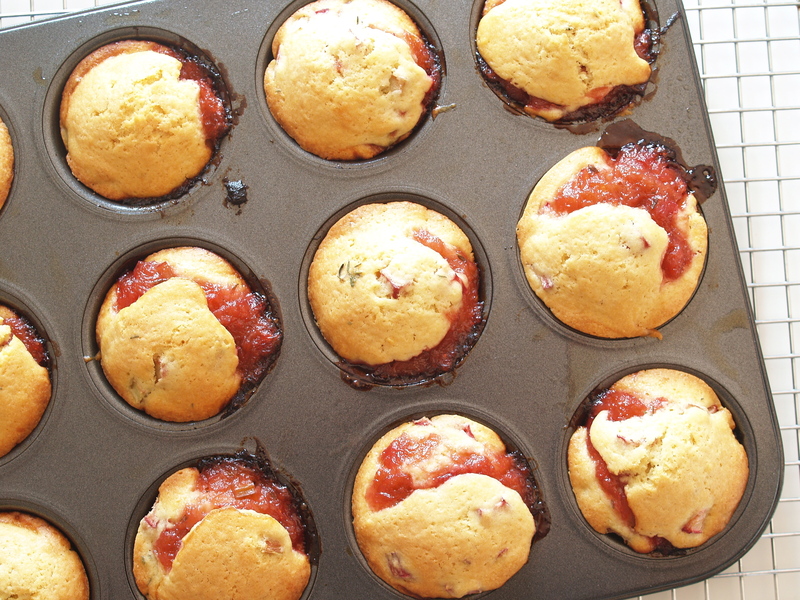 Top with 2 teaspoons of compote and an additional tablespoon of batter per muffin cup. Bake. Bake the muffins for 20 minutes until a toothpick comes out clean. It’s been over a month since I’ve found my way back to this place. During that time I’ve been preoccupied with a promotion to maitre d’ (!) and completion of my “trail.” Restaurant speak for training, the trail was harder and longer than I expected. When my manager approached me about the MD role (double entendre duly noted), he warned me that it is one of the most difficult jobs in a restaurant. On par with expediting, he said, it’s crucial for ensuring a great experience for guests and for the team. I laughed off his warning, mostly because of the uncomfortable audacity of accepting a role that was acknowledged by him as one of the most important in the place. 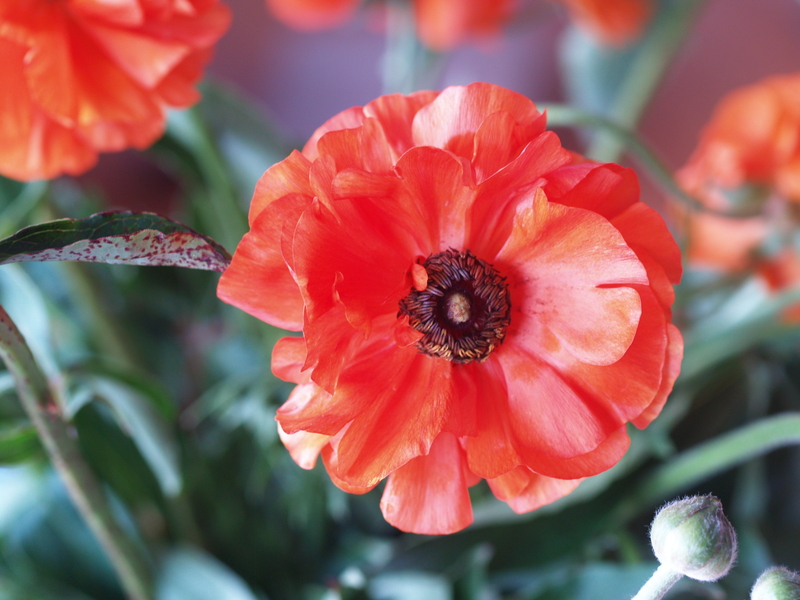 But I was also lulled into a false sense of confidence by the ease and grace with which the other MDs did their jobs – they remind me of dancers who seem to effortlessly float midair while leaping – and by my own hubris that the job would come naturally. A few trails in, I realized that it didn’t come naturally. I had memorized “the book” – the rules for organizing the dining room and reservations as well as the exceptions to those rules – but I wasn’t sufficiently comfortable with my level of knowledge. And it showed. One afternoon when a large crowd descended upon the restaurant at noon, hungry for lunch and intent on sitting down immediately, I froze. Afraid to make a mistake, I was afraid to do anything. In a moment of panic, I viewed our guests as the enemy and wanted to duck behind the podium to shield myself from their bullets of inquiries, requests, and expectations. But I put on my best forced smile and welcomed them through the doors with the sole intent of getting them into the dining room and away from me as quickly as possible. There I stood, in the bastion of hospitality, praying that everyone would just go away so that I could breathe. After the first rush, I escaped to the coatroom for a few moments of quiet. I muddled through the rest of the afternoon and somehow finished out the service, ego bruised but otherwise unscathed. I was embarrassed then, and I’m embarrassed now as I write this. Luckily, there’s a happy ending. To build back my confidence, I hunkered down and studied my job as if I were in school. Just as my father solidified my knowledge of math by pushing me to derive formulas from first principles rather than merely memorizing them, I dissected the book and figured out how and why it was set up the way it was, approaching it as if I were building it from scratch. A visual person by nature, I drew out a timeline of each lunch and dinner service, each table and when it turned for the next, how many people could sit down in the restaurant at each fifteen-minute interval in a way that wouldn’t overload the servers and kitchen. I made a Gantt chart of each activity an MD needs to accomplish by what time and the activities of other team members that are dependent on those milestones. In other words, I geeked out. Like a consultant, I spoke with servers to find out the best way to handle different situations, for example, when I might need to double-seat them – should I try to provide at least a five-minute buffer interval? Give them a heads up? Ask the host to provide a menu? – yes, yes, and maybe. I wrote long lists of useful phrases – how to explain to guests if we were running behind, if we couldn’t seat them at a seemingly available table, if there was a waitlist for the bar. As you might have guessed, my approach worked and I started having fun in the restaurant again. I’m now officially an MD (our general manager calls me MD2 ), still building up my muscle memory, but approaching the job with confidence and a genuine smile. While all of this has been going on, the greenmarkets have exploded and my earlier MD schedule (I finish at 3 pm when I work lunch) has allowed me to wander through an expanding and bustling Union Square each market day. The market now snakes around the north end of the square in two parallel rows that span about three blocks. While I rejoiced in new produce – asparagus! fiddleheads! rhubarb! strawberries! – and filled my fridge with color, MD trailing left me with no mental energy to cook. The result? 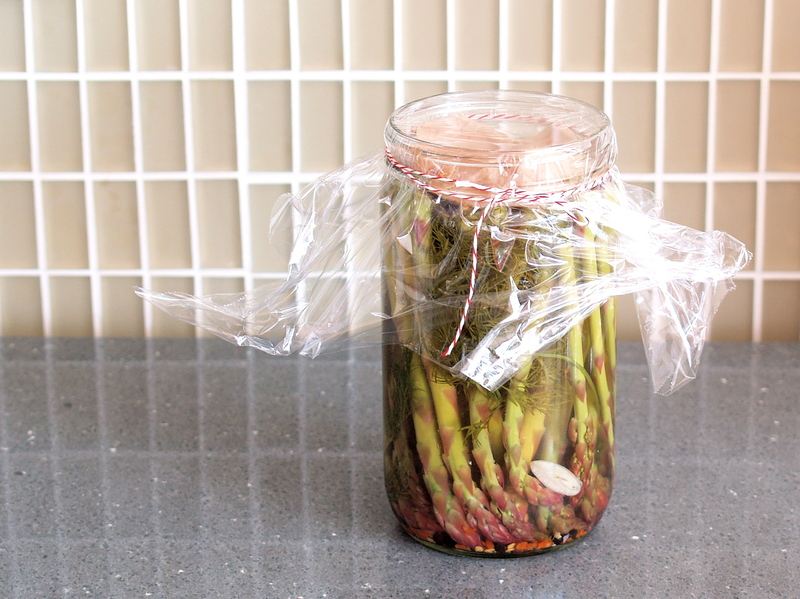 These quick pickled asparagus – a good snack after a stressful shift. Or at least a way to get in a few vegetables before sticking a spoon into a pint of ice cream. I’m back in the kitchen these days, so next up: rhubarb muffins! See you back here soon. Adapted from Food & Wine. The pickles take just moments to prepare and are ready after a night in the fridge. They’re sharp and spicy and their flavor intensifies the longer they sit in their vinegar bath. Fill. Snap the woody ends off the asparagus and trim them so that they will fit into a wide-mouth 1-quart jar. 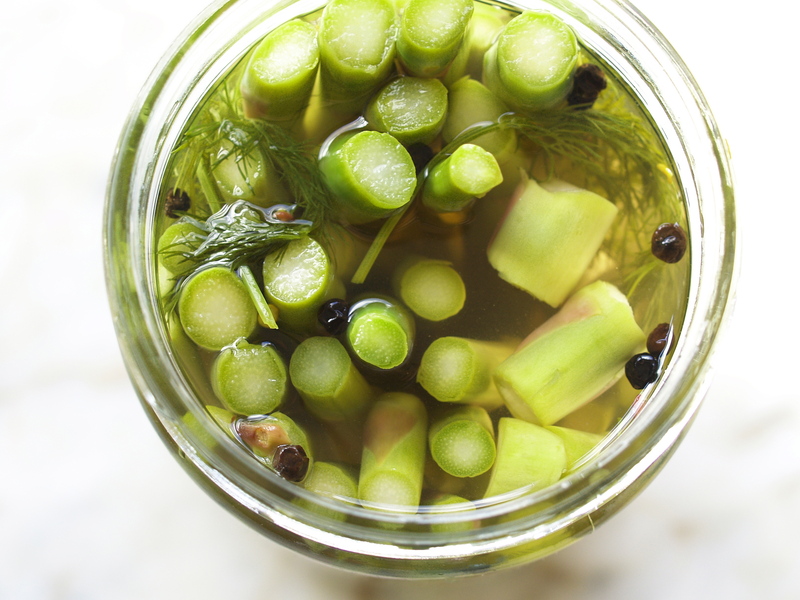 Fill the jar with the asparagus and dill. Heat. Heat the vinegar, water, salt, garlic, and peppers until the salt dissolves. Allow to cool. Pour. Once the vinegar mix is lukewarm, pour it in the jar. Top off with a 1-to-1 mix of vinegar and water to cover. Chill. Refrigerate overnight and eat within three days.